Directly connect an iPod® nano or iPod® to the pioneer head unit to control menus and songs on the iPod, including the lastest shuffle function, via the head-unit interface. It's as quick and easy as manipulating the iPod itself. 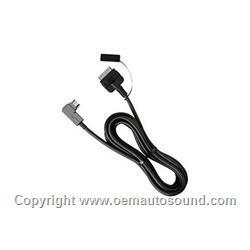 The cable is 2 meters (6.5') in length, and plugs into the Dock port on the bottom of an compatible iPod or iPod nano (3rd-, 4th- or 5th-generation iPod, iPod nano, iPod Video).